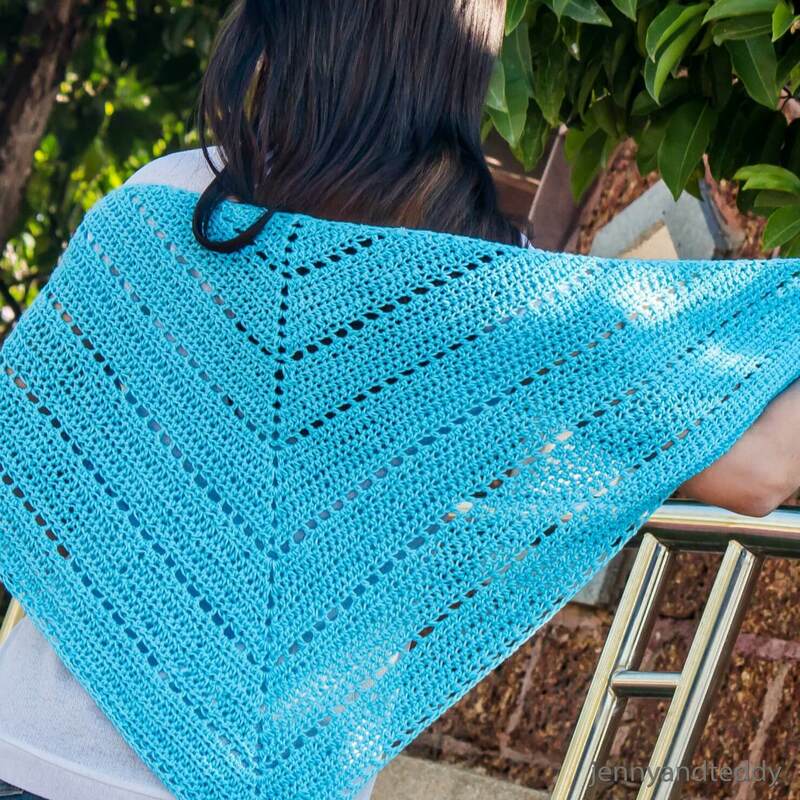 Hello spring shawl crochet triangle scarf is easy and simple to make. I pick up this light blue color cotton yarn that make me feel like I am spending time to crochet in the flower garden with the clear blue sky and a fresh smell of flowers all around me. 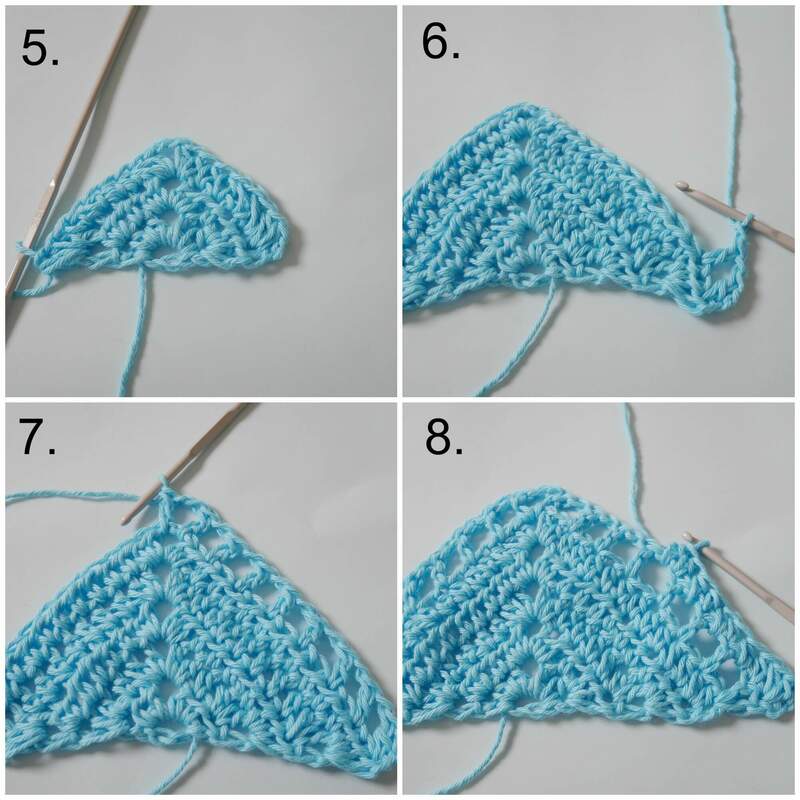 This super easy shawl triangle scarf make with a very basic crochet stitches, like single and double crochet. Same as The weekend triangle scarf. 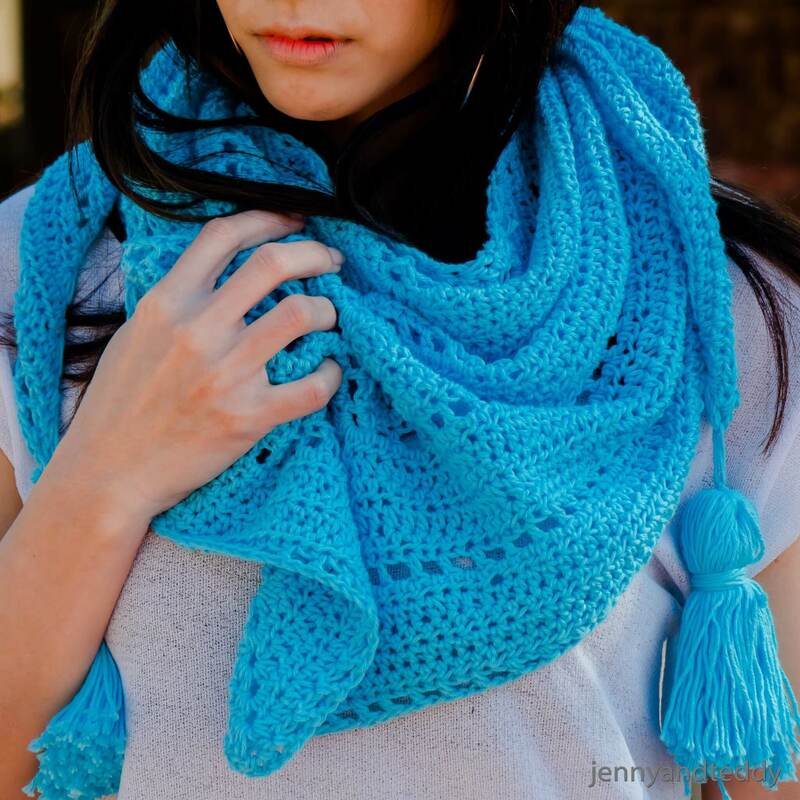 So it perfect to be your first crochet shawl project. 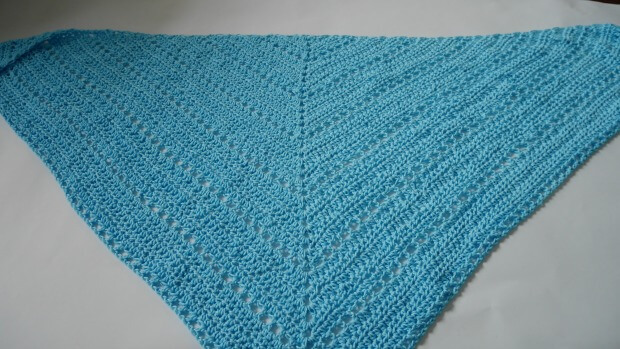 This shawl is light weight and airy with the cotton yarn. This triangle scarf is make from top down with 3.5 mm crochet hook. 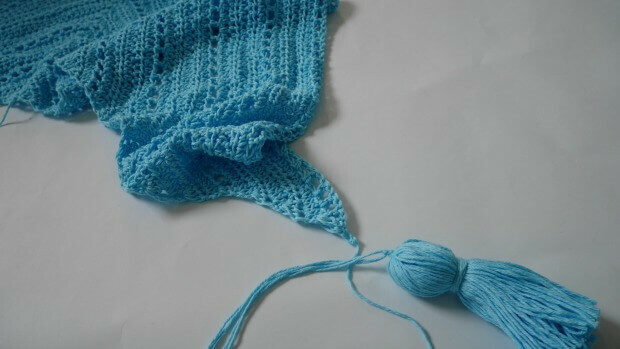 – I used Lion brand 24/7 cotton 3-4 skein including tassel. Add to your ravelry queue. Start of by making a slip knot Then make 5 chains and slip stitch to join end to form the circle. Row1. ch2, (count as first hdc stitch), 2 hdc into the circle, ch2, 3hdc into the circle. Row2. ch2 , (count as first hdc stitch), turn. 2hdc into the first st, make 1hdc in each of the next st until at the middle point ch space, ( in the middle ch space make 2hdc, ch2, 2hdc ), then 1hdc in each of the next st, Now we onto last st of the row ( the chain2 from previous row) make 3 hdc. Row5. ch2 , (count as first dc stitch), turn. 2dc into the first st, then *ch1, skip1,1dc in next st* repeat * to* until at the middle point chain space ( in the middle point ch space make 1dc, ch2, 1dc ), then *ch1, skip1,1dc in next st* repeat * to* .Now we onto last st of the row ( the chain2 from previous row) make 3dc. Row6. ch2 , turn. 2hdc into the first st, *make 1hdc in next st and 1 hdc in ch space* repeat * to * until at the middle point ch space, ( in the middle ch space make 2hdc, ch2, 2hdc ), then *make 1hdc in next st and 1 hdc in ch space* repeat * to * . Now we onto last st of the row ( the chain2 from previous row) make 3 hdc. Row7 and beyond. Repeat row 2-6 for the rest of the pattern. Weave in all ends with yarn needle. Then add some pom pom or tassels for decorate. 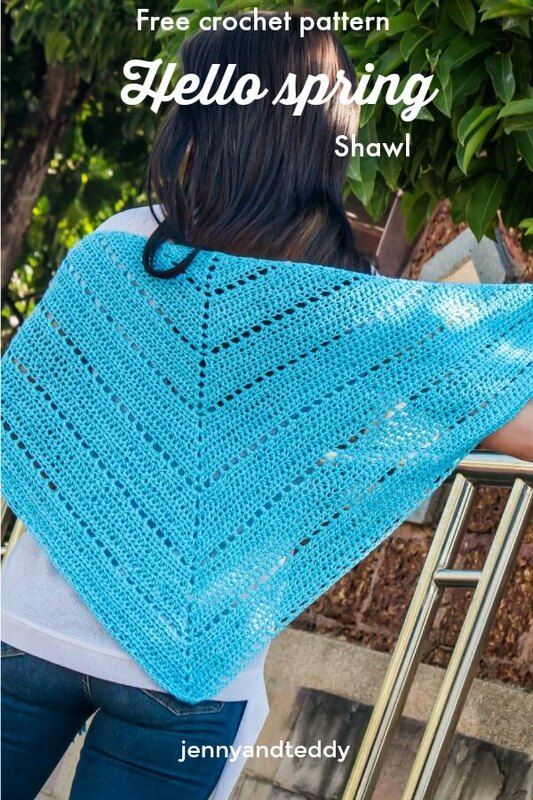 Love the look of your shawl. Do you have a general idea as to how much yarn you used? Hello Jane! I’m just starting your lovely shawl, but have a couple of questions. Are rows 2, 3, and 4 exactly the same…. using hdc’s all along the stitches? In the first part of the row instructions of rows 1-5, it says, ch 2 counts as 1st DC (but there are no other Double Crochet stitches listed in the pattern). Just want to be sure I’m doing it as you planned. Edit to my first comment….there are double crochet stitches in row 5, but just making sure All of the other rows are half double crochet stitches. Thanks so much! yes it’s double crochet in row 5 because will make the scarf airy and other row are half double crochet to make it dense. Thanks you for asking Louise to make sure. Hi Louise row 2,3,4 are exactly the same using hdc all long. 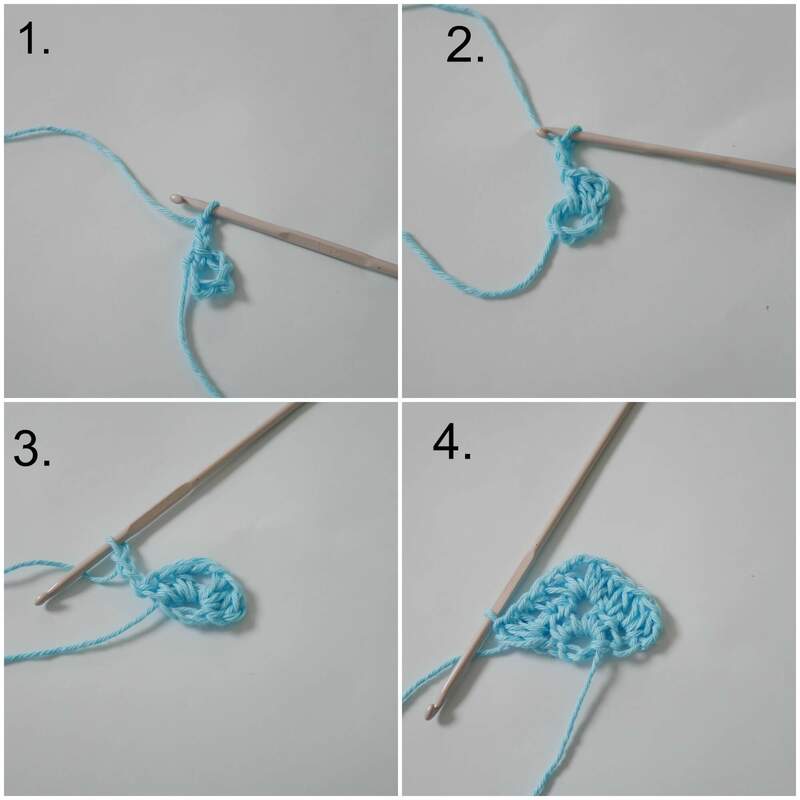 I just corrected the pattern by add double crochet in the skill you need section. So over all chain 2 at the start is count as a stitch. Ps.I will make video tutorial for this pattern in a couple day. Thank you so much, Jane, for this clarification and prompt response – that’s what I thought and I have been working on my shawl. I really like how it is turning out!. It is an easy and pretty pattern and I appreciate that you offer it for free. When it is completed, I will link it to you on my Ravelry projects. Thank you for sharing your creativity with all of us! Hi Becky, It’s a good question, yes! please you can use any kind of cotton just the yarn weight is 4 worsted. Aww thank you so much Donna! I love to see your creation and you did a wonderful job on it well done.